Can the millennial Republican version of Leslie Knope save Connecticut? The state of Connecticut has seen better times. Under Governor Dan Malloy (D), they’ve seen a massive tax increase, businesses leave the state, a brain drain — and next year their deficit will rise to an estimated $900 million. As the 2018 gubernatorial election looms in the near distant future, the answer to Connecticut’s woes may be to elect a millennial. Mayor Erin Stewart isn’t yet 30-years-old, but she’s already being considered to be a political powerhouse in the Constitution State. 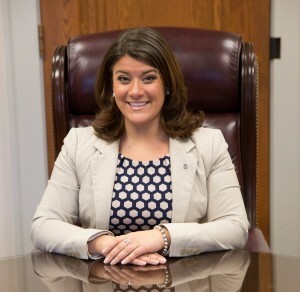 She was elected Mayor of New Britain, a city of 70,000+ people, at the age of 26 and has led the city to major changes. She closed a $30 million hole in the budget, created a $15 million rainy-day fund, led the fight against homelessness, and worked to revitalize the city’s downtown. Unlike other cities in Connecticut, New Britain doesn’t have a town manager. Stewart’s fingerprints are every detail of the decision making for the city — no easy task for anyone. “I’m doing all your hiring, your firing, all the legislative work. I’m kissing babies, shaking hands, taking pictures, cutting ribbons too,” the mayor said with a smile. It would seem that Stewart was destined for political stardom. Her father became the mayor during her teen years and stressed his daughter to get active in some kind of community service. Though she hated living with all the criticism that came with being the mayor’s daughter, she joined a commission in youth and family services that oversaw Parks and Recreation and after-school activities. “Where you like Leslie Knope from Parks and Recreation?” I asked her. After college and bouncing around several jobs for notable Connecticut Republicans including former Gov. Jodi Rell and Rep. Nancy Johnson, the most pivotal moment of her young political life was attending a town hall to discuss New Britain’s new landlord fee being imposed their Democratic mayor. Hundreds of protesters gathered both inside and outside the event, chanting against the mayor. Stewart was flabbergasted that the situation got so out of control. Campaigning as a 25-year-old is no easy task. Many millennials running for office often face criticisms from Baby Boomers of being too green, too young, and uninformed to govern effectively. Stewart was no exception to such criticisms. Having a former mayor as a father also proved to be a double-edged sword. People pushed the feelings they had towards her dad, both negative and positive, onto her. “I found that I needed to separate myself from him, and let people know that I am my own person, and I have my own ideas,” Stewart said. She won a double-digit victory against the incumbent. Her re-election was even more impressive. Despite the city having a 7-to-1 Democratic advantage, Stewart won with more than 67 percent of the vote and flipped the city council to electing a Republican super-majority for the first time in decades. While many popular incumbents make their re-election all about them, Stewart said that electing a legislature she could work with was imperative. Throughout her two terms in office, she has made communicating with the public over the shared sacrifices they would have to make to get the city up and running a priority, that included closing their $30 million operating budget. Stewart said that her leadership goals don’t end at city hall. She insisted that she also hopes to get more women active in running for office. “Women have a bad tendency of diminishing their own value,” Stewart continued. A bright spot in Stewart’s recruiting efforts is 25-year old Desiree Agosto, a Latina Republican running for the state legislature in 2016. The mayor said that women need a better support system of other elected females that push that to run for offices. Despite coming from a political father, she said owes her career to Rep. Johnson and Gov. Rell, who inspired her. Stewart credits her success with running as a pragmatist rather than an ideologue, and stated that she felt there were some issues, especially dealing with education, poverty, and homelessness, that shouldn’t have a party label on them. It’s that kind of leadership and thinking that her home state needs in desperately, as it has created an environment that’s anti-business and anti-millennial. Under Gov. Malloy, the state has seen it’s two largest tax increases in history and is still billions in the hole. Stewart feels that the state’s capitol needs a similar overhaul. “That’s what has to happen in the state of Connecticut: you have to restructure your entire governmental operations. That is no simple task to do because government in Connecticut is so large. There is a serious problem when the largest employer in the state of Connecticut is the state of Connecticut,” Stewart said passionately. That includes combining resources, merging departments, and still be able to provide vital services, while fixing the tax structure to make it more reasonable across the board. Stewart left off with a message of hope, hope that leaders restore faith in the state government and that there are people in politics who care about their issues. It’s up to elected officials at the top to set that tone. This story originally appeared in Red Alert Politics on June 2, 2016.